Chewing is a natural behavior for dogs so proper care of the teeth and gums start at a very early age. The teething period begins once the adult teeth start to come in, which causes pain and soreness in the teeth and gums. Chewing helps alleviate the pain and soreness but hard chew treats can damage or break immature teeth. Any damage or breakage to immature teeth can expose the nerve so the proper chew treat is critical to the development of teeth and gums. 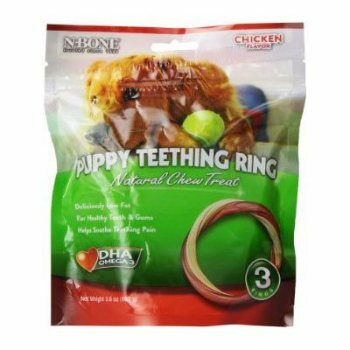 Puppy Teething Ring is flexible and pliable and safe for a teething puppy because the gummy or chewy texture of the treat will not break or damage immature teeth.